Eight cases on how corporate universities shape(d) their strategic role. They are authored by corporate university executives, and edited by the lead author. Companies included are Shell, ING Bank and DHV Group, and also (Dutch) non-profit companies in the water industry, housing, and government. Also included (in Chapter 15) are examples of IKEA, Exact, and Ducati. Three visionary chapters about the past, present and future of corporate universities, featuring the development of ING Business School, and identifying different generations of corporate universities, including Disney, Apple, Heineken, TNT and Ahold. Attention is paid to the impact of new technology en social media on learning in organizations. In the final chapter, an analysis is being made of the cases in the book. Five strategic issues for corporate universities are identified, such as the questions of being vision-driven or issue-driven. 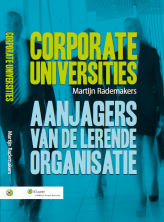 In short, “Corporate Universities: Aanjagers van de lerende organisatie” is a challenging book that caters for the growing need for knowledge and insights into the strategic potential of corporate universities. The state-of-the-art frameworks and examples are a must-read for managers and professionals who want to get the most out of the strategic learning capability of their organization.